When it comes to the world of residential lighting, many shoppers are quickly overwhelmed by the vast amount of options and possibilities surrounding the illumination of their home. While there are many types and styles of home lighting fixtures, today we’ll start simple by previewing the three most basic types of lighting. 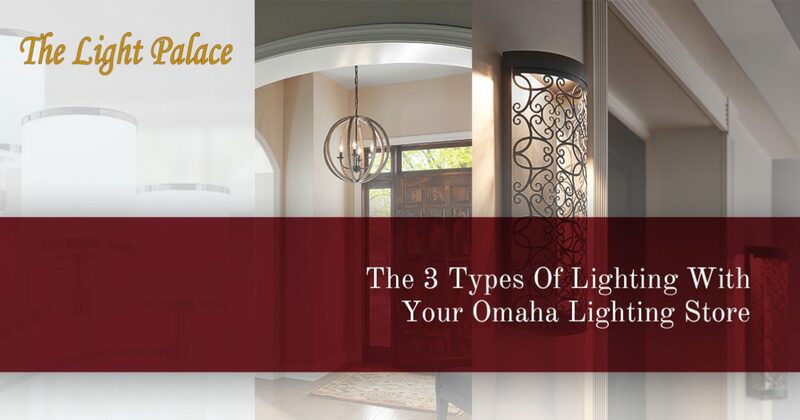 As one of the best lighting stores in Omaha, The Light Palace is here to help shoppers of all skill levels to find the best, most modern lighting options available. Our knowledgeable staff is here to offer informative solutions for any and all of your unique lighting needs. We’ve been lighting Omaha for more than 50 years, and we’re ready to help you! There are three main styles of lighting that can adorn your home. For the best results, The Light Palace recommends utilizing a healthy combination of all three to maximize your lighting style and functionality. Be sure to plan your remodel accordingly, as light fixtures tend to look the best when chosen together in generally matching sizes and styles. Also known as general lighting, this style provides illumination across entire areas of the house. This basic style allows for comfortable lighting that works to light up the room for general enjoyment and safe walking practices. The home lighting fixtures that you can utilize vary, yet all options work to accomplish the same goal of illuminating a room. Whether you’re in need of a chandelier in the dining room or modern outdoor lighting fixtures to light up your porch, this light source represents the basic building block of home lighting solutions. This style of lighting is helpful for accomplishing tasks throughout the home. Your nightstand, for example, may hold a lamp that is useful for reading a few chapters before bed. Looking for a pendant light to illuminate your pool table? Preparing food under cabinet lighting? These activities require proper lighting to ensure quality results, which is why task lighting is so important. Finding the perfect product for this task can be difficult, as task lights should be bright enough to get the task done without straining your eyes or causing unwanted glare. Coincidentally, this style should be chosen before any other lighting type, as the intensity of light should be used to set the tone for the rest of the room. If you are in need of quality task lighting, be sure to stop by the showroom in our lighting store in Omaha for assistance! Only owning ambient and task lighting structures can create an atmosphere that is almost clinical in nature. Lighting options are needed that help to create drama and excitement in your home. Accent lighting is ideal for drawing your guests’ eyes to focal points in the room, whether they consist of proud plants or beautiful architecture. Generally, this lighting style will utilize a brighter illumination over the general lighting in order to stand out and make a statement in the space. Fixtures such as sconces, wall lights, and track lighting are ideal for helping the focal point of your room to stand out. Using all three lighting styles in a healthy combination can help to create a captivating, well-lit space that makes your friends and family feel right at home in your house. The process of combining and separating each style varies based on the interior scheme and shape of each room, creating a large demand for proper planning. If you are wanting to update your home, let The Light Palace help! Our lighting store in Omaha is the perfect place for finding quality solutions to any unique space. From wall lights to chandeliers and more, our store is ready to lend a hand. Contact us today for answers to any of your lighting questions before visiting our showroom!